The new page with FAQs posted by some of our members, has been published. There are still many questions that need to be answered. I have posted 21 questions and their answers for now and will update the page once I have written my responses to the remaining questions. 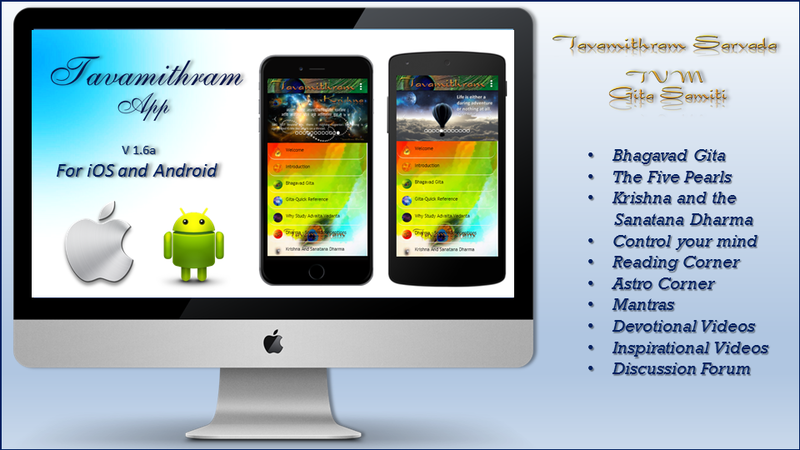 The latest version (1.6a) of the Tavamithram App is ready. It contains the entire Bhagavad Gita too. Suggestions that will help improving the App are most welcome. Quite a few visitors and members of our site have faced relationship problems. They came to our site looking for ways to clear misunderstandings they have had with their loved ones or to bring back someone who left them. Compatibility problems and disagreements happen to people from all walks of life. Trouble in a relationship usually starts when there are misplaced expectations. It is a natural quality of humans to expect others to be like them and want them to agree with them in everything. PS: Special thanks to my beloved son for being the narrator. Many of you must have watched a video of a European man talking about him being a ‘veggie vegan’ (sic) on Facebook or through WhatsApp. This new post in the Reading Corner is about the myth of meat and dairy being good for health, and about the non sequitur rants and arguments that supporters of animal exploitation are known for. You can also watch an excellent short video by ‘Mercy for Animals’ featuring Dr. Milton Mills. Understanding the ‘Who am I?’ question through the Chariot Analogy explained to Nachiketa in the Kat-hopanishad by Yama, the lord of death. Ego plays a major part in the lives of people. It is one of the major causes for discords among people including closely related people, married couples, close friends and colleagues at work. The lack of understanding about who one is and how actions are performed by people is the prime reason behind this mental disease called ego which invariably leads people to major downfalls. Young Nachiketa receives the divine knowledge directly from Yama, the lord of death. Standing face to face before death blessed him with Atmajnyanam or the knowledge of the Self. Understanding the brevity of life and the impermanence of all material possessions removes ego and all other negative qualities associated with it. One of our friends is designing a Bhagavad Gita mobile phone App for us and we would greatly appreciate ideas and suggestions to build a useful, user friendly and an easily affordable App. The prime objectives are to make reading the SBG and referring its Divine verses as easy, enjoyable and comfortable as possible. 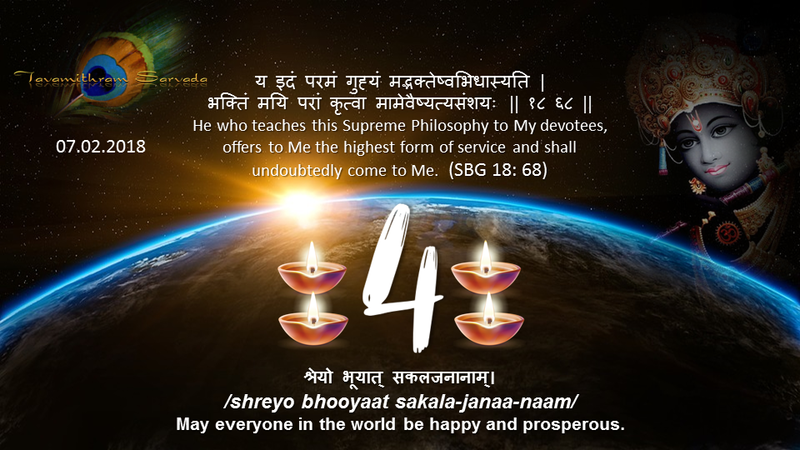 The Divine Knowledge gained by people by reading the SBG will straightaway clear their minds of false notions, improve their lives and fill every moment of their sojourn on the planet with love, gratitude, appreciation, kindness and Divine Grace that collectively aid in the process of a person’s Karmic evolution. Even a person who hears this divine conversation with deep faith being free from malice, will attain liberation and the auspicious worlds of righteous people. This post is in response to some mails I have received from people who are nursing a broken heart or are undergoing stressful situations due to separation from someone they loved and shared their life with. This is not a response to any particular mail from anyone but a few thoughts on ways to handle a breakup. Separation can be something gloomy, melancholic, stressful or traumatic but at the same time it can also a great relief for those who suffered due to bad relationships or marriages. We come across thousands of people in our life but how many do we get to know, make friends with, build deep and sincere relationships with, get married to and live together until the end. Therefore, there must be some Karmic reasons for people to come together in a life time, especially when they are from different corners of the world and met despite the odds of their meeting being were very low. Two things about a breakup are that either you wanted to happen or you didn’t want it to happen. A lot of people, particularly Vrischikans and others undergoing periods of Saturn have written to me expressing the difficulties they face due to financial problems. I performed a special Mahalakshmi Puja this morning and prayed for Divine Grace to help people financial troubles overcome their challenges and be blessed with Lakshmi Kataksham. I have added the Sri Mahalakshmi Suprabhatam on our TVM Mantras site. It would be advisable for people to listen to the Suprabhatam every morning before commencing their work. May all be blessed with health, wealth and peace. Please click here to visit the Isha Upanishad (Ishavasyopanishad) page. The Ishavasya Upanishad presentation is ready but I would like to publish it along with an audio recording for which I will require one more day. It will be a presentation along with an audio recording of the 18 verses of the Upanishad which describe the greatest and the most logical, real, rational, scientific and sensible way of life – The Sanatana Dharma. A presentation on the Ishavasya Upanishad will posted on 12.01.2018.